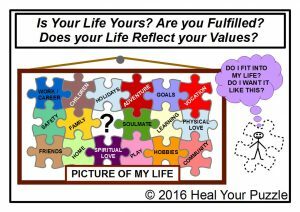 Heal Your Puzzle » Blog Archive » Does your Life Reflect your Worth? … What is ‘Worth’? Just Money? Or a Feeling? Does your Life Reflect your Worth? … What is ‘Worth’? Just Money? Or a Feeling? I found this quote by Coco Chanel: ”There are people who have money and people who are rich”… and it got me thinking about Money, about how we perceive Worth in our society and how it is mapped into our psyche and therefore into our bodies. If Money was abundant, would we feel fulfilled? Would we be naturally self-confident? What would our lives look like? …Over-indulgent? More freedom? Would we care about each other in the same way? What would be our Value System – what would we consider worthwhile? How would we make decisions? Imagine all that leisure time! …Would anything get done? Any homes built? Infrastructure? Who would work in shops and businesses and why? Who and why go to school? How would we and our environment survive or prosper? How would we manage our civilisation? Just these few questions show how influential money is in shaping our lives; we have to decide on our priorities and what’s important because we can’t have it all… and this varies across cultures. Our Value System including our own Self-Worth is not necessarily based on Money, of course, but the two seem to be inextricably linked in our society. As a Kinesiologist, I am interested in our innate behaviours and how our physical and emotional health reflects our deeply held energy patterns – our inherited traits and those acquired through life experience. It has always intrigued me as to why, when goal setting for prosperity or any positive goal for that matter, some people have an easy ride and others are beset by problems and cannot get off the starting blocks! Very Frustrating! Money problems really can feel like a ‘Poverty Trap’. ‘Worth’ is a Value Judgement and not Innate – How we value something is a personal choice and as such is based on our inherent psychological map of the world, how we perceive ourselves, each other, and our environment and more importantly how we feel about all that. It is not only a personal choice however; we can also be greatly influenced by our Peers, our Community, our Culture, our Nation… and this may cause great inner conflict! ?